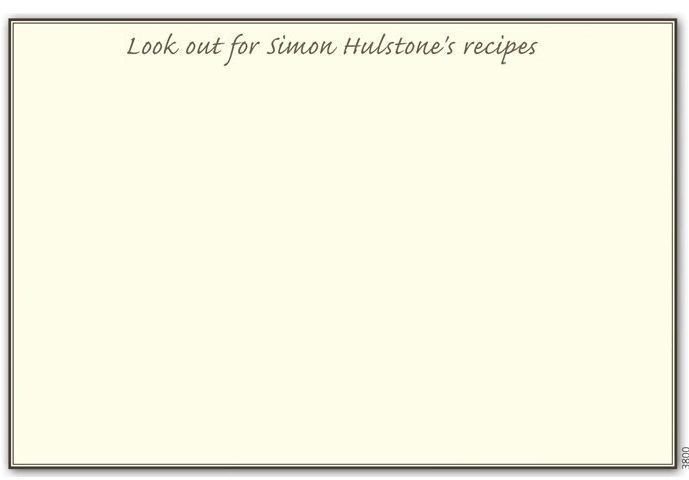 Click below to view a selection of tasty recipes created by award winning Michelin star chef Simon Hulstone. Few chefs in England are busier than Simon Hulstone. 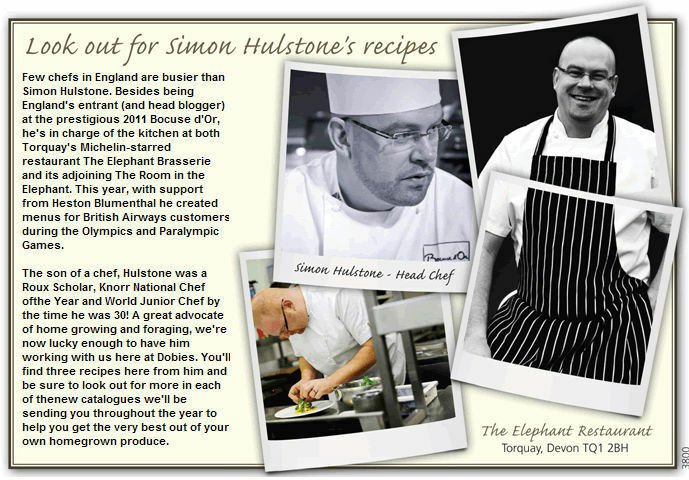 Besides being England’s entrant (and head blogger) at the prestigious 2011 Bocuse d’Or, he’s in charge of the kitchen at both Torquay’s Michelin-starred restaurant The Elephant Brasserie and its adjoining The Room in the Elephant. This year, with support from Heston Blumenthal he created menus for British Airways customers during the Olympics and Paralympic Games. The son of a chef, Hulstone was a Roux Scholar, Knorr National Chef of the Year and World Junior Chef by the time he was 30! A great advocate of home growing and foraging, we’re now lucky enough to have him working with us here at Dobies. You’ll find three recipes here from him and be sure to look out for more in each of the new catalogues we’ll be sending you throughout the year to help you get the very best out of your own homegrown produce. Dice the potatoes into approx 1cm pieces and blanch until three quarters cooked in boiling salted water. Meanwhile, in a sauce pan cook the onion and garlic until transparent. Add the cream, bring to the boil and allow to simmer. Place the potatoes into a heat proof oven dish and pour over the cream. Grate nutmeg as desired on top and season to taste, finish with grated Gruyere. Bake in the oven at 160°C / 325°F or gas mark 3 for 10-15 minutes. After the cooking time, check the potatoes are cooked through and if necessary turn the oven higher to brown the topping, allow to cool slightly and serve. Finely chop the onion, carrot and sweet potatoes. Place the chopped vegetables into a saucepan and add the butter, cook until tender but with no colour. Add the stock and curry paste to the saucepan and cook for a further 15 minutes. Transfer the mixture into a food blender and add the coriander and coconut cream and blend to a smooth consistency. A dollop of goat's yoghurt and fresh coriander leaves to finish would be perfect. If not using a pre-made tart shell, roll out and line a 9" tart case and cook until golden at 170°C / 325°F or gas mark 3, allow to cool. Preheat oven to 120°C / 257°F or gas mark 1/2. Finely slice the onions and add these to a saucepan along with the butter, garlic and lemon thyme leaves on a low heat being careful not to colour for about 15-20 minutes. Remove from the pan draining any excess liquid or fat. Allow to cool slightly and then add the milk and cream, then the beated eggs and make sure all are incorporated thoroughly. Add seasoning to desired taste. Spoon mixture into the tart mould ensuring more onion than liquid. Place into the preheated oven and cook for 20 minutes or until the egg mixture has firmed. Remove from the oven and allow to cool before cutting, serve with a rocket salad dressed with balsamic vinegar. Cut a slice of watermelon approx 2 inches square, by 1cm thick. Cut this slice into 4 further sections and place them on a hot griddle pan for 2-3 mins (you don't need to do both sides, it's up to you). Roughly chop your red onion into wedges. Take your feta cheese and roughly crumble it into 1-2cm pieces. Place a few slices of red onion on the bottom of your serving plate or bowl, sprinkle your feta. When your watermelon's done, simply add it on top of the feta. Finish with some virgin olive oil. Season with salt but not too much as there's already salt in the feta. Finally, add your microgreens as a finishing touch. Stir in the orange juice, and add the star anise and carrots. Gently poach on a medium heat for 10 – 20 minutes until tender. Cooking time will depend on the size of your carrots. then add the cream, salt and pepper to taste and blend again until smooth. Peel the celeriac and reserve the peeling for a stock. Finely dice the flesh. To make the stock, add the celeriac peel to 500ml of water, boil for 30 minutes and then strain to remove the peel. Melt a knob of butter in a pan on a medium heat. Add the diced celeriac and slowly stir in your celeriac stock a little at a time, just like a risotto. When the celeriac is tender and the stock has boiled away, stir in your wild garlic puree and season to taste. Cover a microwaveable bowl tightly with Clingfilm. Lightly brush the wild garlic leaves with olive oil and season with salt. Carefully place the leaves on the Clingfilm and microwave for 30 seconds until crisp. Melt the butter in a heavy-based ovenproof frying pan over a medium-high heat. Add the rosemary and the lamb and sear the lamb for 3-4 minutes, turning once or twice, until browned all over. Transfer to the oven and roast for 6-8 minutes (for medium) or until cooked to your liking. Add the vegetables to a saucepan with the wine, peppercorns and rosemary. Bring to the boil and keep it bubbling for 5-10 minutes until the liquid has reduced by two-thirds. Whilst it’s boiling check on the lamb which should be ready. Remove from the oven, cover with tin foil and set aside to rest in a warm place for five minutes. Strain the jus and combine with the cooking juices from the roast lamb fillets. Stir in the knob of butter and season to taste. Slice the rested lamb fillet and plate up with your carrots, celeriac risotto and jus. Use a peeler to shave your runner beans lengthways. Sauté the shaved runner beans in a pan with salted butter and a dash of water for around 30 seconds until tender. Half the asparagus spears lengthways and arrange on the plate. Top with the sautéed runner beans and poached egg. Garnish with primrose flowers and borage shoots and finish with a drizzle of the runner bean butter sauce. Thinly slice your tomatoes and arrange them on the plate. Spread a spoonful of tapenade over them, followed by 5 or 6 confit tomatoes. Put all the ingredients into a blender and wiz up until you’ve got your preferred consistency. Or for a chunkier tapenade, chop the olives capers garlic and basil up together and the combine with the lemon juice and oil. Season to taste.For a more mature flavour add an anchovy or two to the mix. Simply lay your tomato halves out on a sheet of baking paper on a baking tray. Sprinkle lightly with thyme, chopped garlic and salt, and cook in your oven on the lowest setting for 4 - 6 hours. Tried any of these exciting recipes? Let us know how you got on via our Facebook page.